Lobbying has long been part of the political landscape. But in recent years links between big business and government have become stronger and more far-reaching than ever. Global corporations now demand control over decisions affecting labour laws, finance, public health, food and agriculture, safety regulations, taxes and international trade and investment. They even claim the right to private tribunals where they can sue governments for passing laws that could harm their present or future profits. These business elites dont want to govern directly. They operate behind the scenes - directing planning, setting standards and fashioning government to maximise their own profits. Thanks to the UN Global Compact they have extended their influence to the highest levels of multilateral decision-making and now, via the Davos-inspired Global Redesign Initiative, they are setting their sights on managing world-wide public policy. Elected by and accountable to no one, secretive and highly organized, these shadow sovereigns are destroying the very notion of the common good and making a mockery of democracy. It is high time we challenged this assault on our rights and our institutions. In this incisive and clear-sighted book Susan George provides us with the practical knowledge to do just that. Susan George is a high profile political scholar and activist whose previous books have been widely read and translated. She is currently president of the board of the Transnational Institute, a world-wide fellowship of scholars and activists. Chapter Five: Davos: Designer Of The Future? "Susan George’s work has provided deep understanding of the world in which we live. Shadow Sovereigns carries these insights further to the carefully hidden core of global decision-making, a matter of prime significance for those who hope to take their fate into their own hands in times when critical decisions will determine the future of the human experiment." "Driven by a virulent strain of neoliberalism, the global corporate assault on democracy has now reached unprecedented and planet-cooking extremes. Nobody is better qualified than Susan George to document and dissect the inner workings of this process. The result is a book will galvanize those new to the subject while providing veteran opponents with renewed urgency and fresh insights." "Susan George has found and revealed the blueprint that transnational corporations are using to conquer our political system. In this vital book, written with characteristic rigor and flair, she lifts the veil on the many mechanisms through which corporations buy politicians, manipulate global policy, and in the process render our democracy a farcical pantomime. 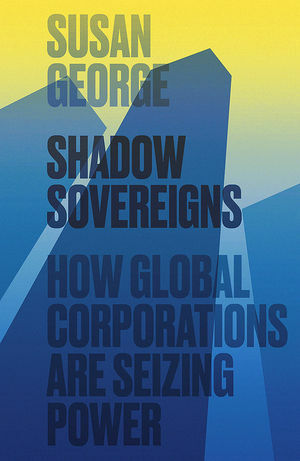 Most importantly, Shadow Sovereigns hauls corporations out of the dark where they like to operate and shows them to be the frontline troops in the neoliberal assault on public life. George’s diagnosis that the grand Enlightenment tradition is being fatally corrupted by what she calls the Great Neoliberal Regression is chilling. But by shining a light on our new silent rulers and telling us how they work, George replenishes the intellectual armory we need to fight back."